Last night at the Terrell City Council meeting Cilla, who I have written about before, was awarded by the Terrell Police Department a Certificate of Merit for her work at the Animal Adoption Center of the City of Terrell. A long list of accomplishment's was read off by the Chief of Police Jody Lay. The ones that caught my ear was under Cillas direction she has established a group of 24 volunteers to assist at the Center. for your outstanding performance while on duty, as an animal control warden assigned to the Animal Adoption Center of the City of Terrell, in reference to your dedicated efforts regarding developing new ideas, concepts and online efforts to aid in animal adoptions. For your selfless dedication and upon the recommendation Councilman Jack Jones and the Chief of Police, The Terrell Police Department presents this Certificate of Merit. 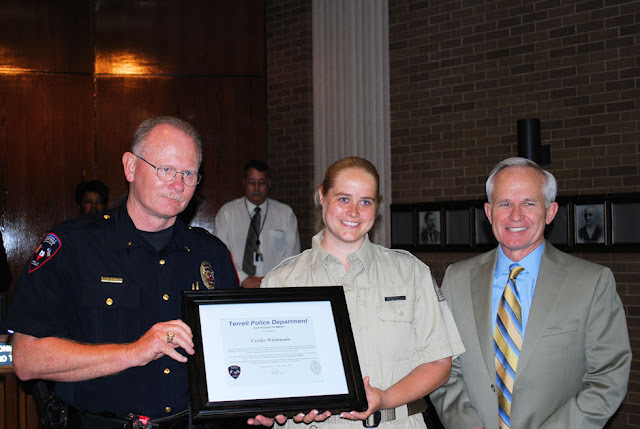 Your actions exemplify excellence in your performance of duties, thereby inspiring heightened respect for the Terrell Police Department and the City of Terrell.